This is the first game in the Micro Machines series. 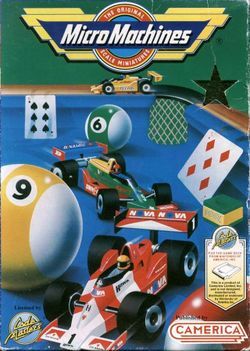 For other games in the series see the Micro Machines category. For the 2002/2003 game, see Micro Machines (2002). Micro Machines, released in 1991 on the NES and in 1993 on other formats, was the first game in the series and laid the foundation of the gameplay: a top-down racing game with miniature vehicles. The race tracks are unconventionally themed. For example, some races take place on a billiard table while others occur in a garden. The cartridge itself was gold (black in Europe) with a switch at the bottom in order to be compatible with the American and European hardware. It was also released as an add-on to the Aladdin Deck Enhancer created by Codemasters.